This scent is light, sweet with a touch of vanilla to it. It's girly, youthful and feminine without being overpowering or nauseatingly sweet. 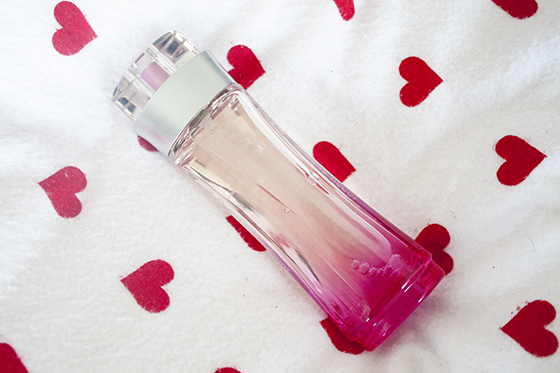 Lacoste touch of pink perfume is uplifting, bright, and cheery, classic but modern at the same time. It opens up quite orangey, but then I get notes of vanilla, jasmine and peach. It's fairly fruity but balances itself out once it's dried down. The staying power isn't really there, lasting between 3-4 house before needing reapplication. Overall I like Lacoste Touch of Pink, However it's forgettable and not really a masterpiece in terms of notes. However I'd imagine it would be a safe, inoffensive choice for most people. I heard somewhere that the Lacoste Touch of Pink gift set is one of the most given gifts during the Christmas period! The price is good for what it is and there is genuinely nothing wrong with it in terms of scent! I liked the fragrance overall but felt like it was something I'd smelt before, with no unique selling point.